Well, two things to take away from the first cross race of the year. 1. If you seed yourself at the back of the field on a wet and narrow course, that’s basically where you’re going to stay. 2. If the leader laps you on what you believe is your final lap, what you believe is wrong. Rookie mistakes today. I should have known better on both. Caught behind the field, and insult to injury, I “finished” and still had one lap to go. Whoops. It’s just as well though. It was 40 minutes of pure torture for me, as I hung on, drooling like a madman, quickly remembering how wonderfully awful it feels to race cyclocross. It’s gonna take me a while to get fit for this. I haven’t had an effort like this since Mt. Washington, and before that, well…it’s been a while. From my first warmup lap this morning I knew today would be a mess, and I didn’t want any part of a mess. Most of the course was far too narrow for a field of 80 riders. It was wet from 2 days of rain and grew progressively sloppy in the corners. I rode only to not crash, so I consider the day a success. Lots of wonderful wet grass. Pretty well run race though. I’d go again. 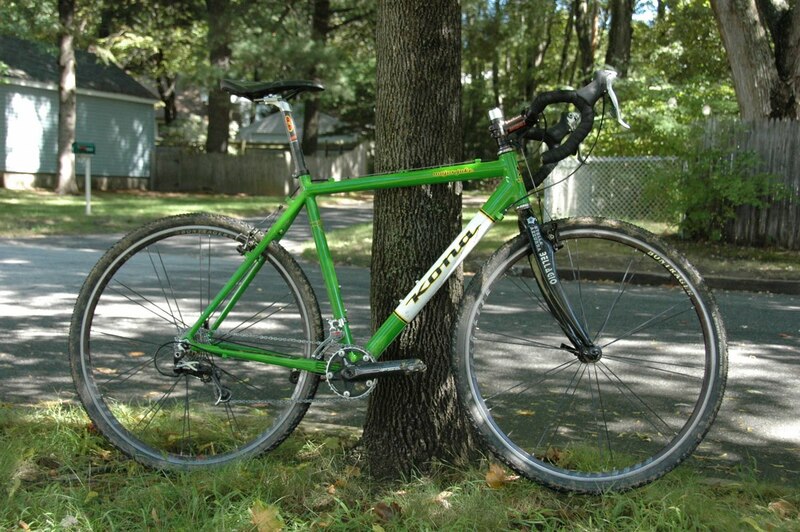 If you’ve been following along, last year I rode singlespeed, which was an interesting piece of science. But this year it’s gears. It’s the year of…The Major. Gears aren’t too bad I gotta say. Used judiciously, they’re very helpful. May have to fine tune a little bit – right now I have kind of a meager 34×11-25 setup, but I think we’ll get there. Racing again next Sunday in Auburn. That one is a good time. UPDATE: See, hanging in there has its rewards. The results have just been posted, and it looks like I out-suffered 16 DNFs. I can’t believe there were 97 racers on that course. Needless to say, there was a lot of broken course tape.